In Rothenburg ob der Tauber, a medieval city in the Franconia region of Germany, it is easy to walk along the cobblestone paths that wind through the town and consider it nothing more than a picturesque throwback to older times. But a stop at the Kriminal Museum shows a very different side of those medieval times and life within its massive stone walls. There on display are iron maidens, witches chairs, neck violins, finger screws and at least a dozen shame masks. The entire museum was fascinating, though I was especially drawn to the shame masks. All of them were made of iron and many were rusting with age. The masks ranged from simple bands of iron that (I’m guessing) were only slightly uncomfortable to full iron head coverings with tongue depressors to stop one from talking. You can guess why you’d have a mask with a big nose, can’t you? For sticking your nose into other people’s business. 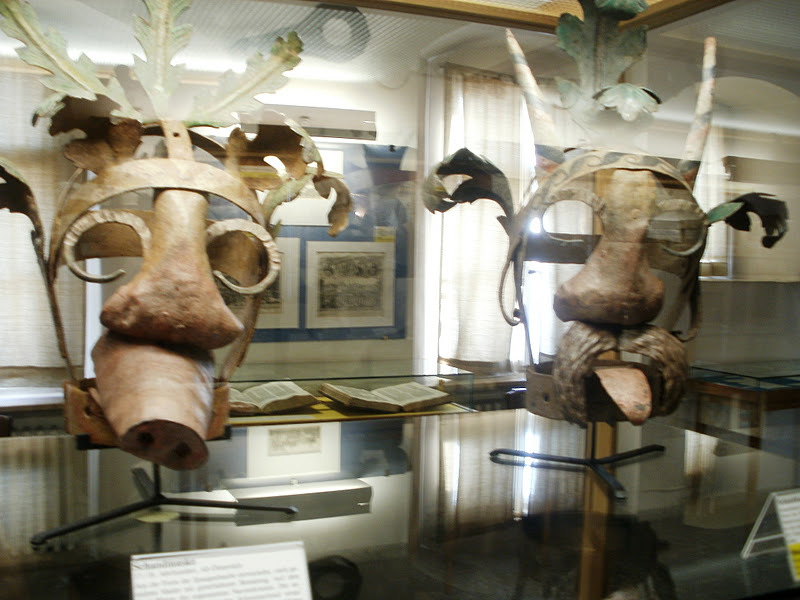 And my personal favorite – a full iron mask with devil’s horns for those who have bad thoughts. (I think I’d try to keep mine secret. Shame Flute: The round part fits around the neck and the fingers are smashed beneath the iron bar to give the illusion that the wearer is playing. In addition to the masks there were greatly oversized necklaces of wooden dice for those caught cheating at games or who were unable to pay their debts. There was an enormous rosary with beads the size of softballs (I can’t remember if they were iron or wooden) that was worn as punishment by those who fell asleep in church or who didn’t show up to church. And they knew, because everyone had an assigned seat, so you’d better have been in it and reverently paying attention! There were cages not much rounder than a bird’s cage that people were caged in. And an iron baker’s chair for bakers whose bread was too small or too light. They were strapped into the chair and then lowered repeatedly into water. There were even shame flutes for bad musicians. Their heads were put into a neck violin and then their fingers were crushed under an iron bar so that it looked like they were playing their instruments, but might never again. Face it, no one could catch a break in medieval times. The town of Rothenburg ob der Tauber certainly looked pretty, but I’m glad I didn’t live there a few centuries ago. What kind of shame masks would you create? And what crimes would they fit? I loved this piece but I’m utterly flabbergasted about it!!! Incredible! I agree with you about keeping my bad thoughts to myself!! And punished over the bread you made?! Wow. I wonder if there was something for all the “tattle tales” in that village? There should have been! I think the most important survival tool would be to figure out how to make yourself one of the judges rather than an accused. Such scary masks. Your post reminded me of the Gilbert and Sullivan song from The Mikado, “Let the punishment fit the crime.” These few lines in particular, always gave me the shivers when we performed the opera at Grammar school. Oh my! You have thought up a new mask! Those lyrics would give me the shivers, too! These are both crazy and hilarious. That last one about being a bad musician kind of got to me, since I’ve played instruments through most of my childhood up until I graduated high school and let me say I was definitely more accomplished at some than others. And who would be the judge of what’s “bad” music? People back in medieval times really had it tough, I imagine! I think of it akin to the Salem witch hunts. Seems like anyone could accuse anyone else of .. anything! I wouldn’t last a minute in medieval times. I don’t have to speculate. I wear a paper shame mask at all times, as can be seen from my gravatar. It’s my punishment for the mathematical atrocities I committed in high school.